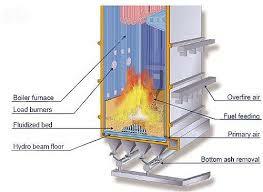 A boiler is always design to absorb maximum about of heat realized in the process of combustion . This heat is transferred to the boiler by all the three modes of heat transfer. This is boiler is simple , compact in construction its initial cost is low . A vertical fire tube boiler occupies little flour space. They are economical only for low presser and therefore available an small sizes having street capacity of about 15000 thousand kg per hour. In this type boiler water flow inside the tube and hot gases flow outside of the tubes. Water tube boiler are classified as vertical, horizontal or inclined fuel depending on whether the tubes are vertical or horizontal or inclined. The circulation of water in the boiler may be natural or force to the action of pump. the factor which affected the choice of and boiler are initial constant availability maintenance cost, labor cost space, fuel cost.